Have you ever wondered what it would feel like to be inside a computer? Jean-Pierre Gauthier’s installation Orchestre à géométrie variable, recently acquired by the Musée d’art Contemporain, is a good place to start. Entering the room, to the right of the visitor, four small electronic panels in the middle of the wall act as the conductor to a robotic orchestra. Following nineteen pre-programmed compositions, these panels control a host of simple instruments mounted on the walls of the room via bundles of colourful, twisted wires. 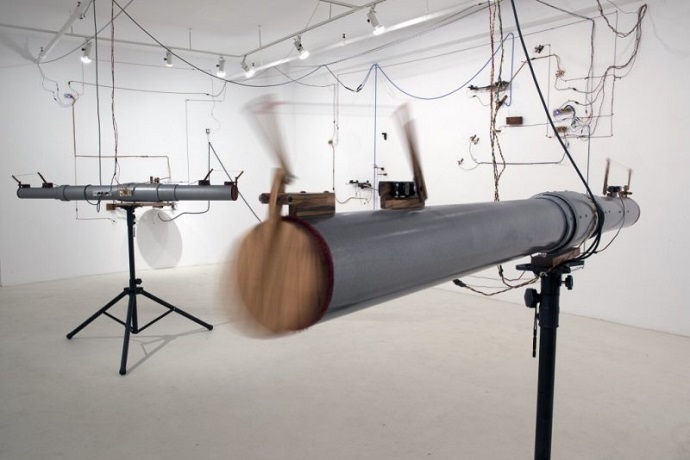 Bows, hammers, wires and cymbals collide to make sound by scraping, hitting and vibrating, while three ‘sound cannons’, mounted like telescopes on tripods in the centre of the room, amplify and modulate the noise. Amidst these mechanical harmonies, an eerie whistling emanates from a space around the corner. In contrast with the real-time performances of the percussion and string instruments, these are recordings of the artist, played back and modified. The man-made sounds bring a human element to the performance, creating a juxtaposition of the natural and the robotic. At the same time, the clean lines of the connections crisscrossing the walls contrast with the constant variability of the compositions. All the while, visitors wander through the constantly changing soundscape, experiencing the symphony from different angles and trying to locate the ‘musicians’ currently playing. The result is a wholly physical, spatial and technological experience of sound. In conjunction with the exhibit, MAC is running art workshops conceptualised by Gauthier throughout the month of October. Participants have the opportunity to experiment with creating, recording and distorting sounds using an array of unusual contraptions. As with Orchestre, the workshop blurs the lines between order and chaos, deliberate and aleatory creation, all the while calling up childhood memories of banging pots on the kitchen floor. For anyone intrigued by the physicality of sound and music, or who just wants a little more noise in their life, Orchestre à géométrie variable and the accompanying workshop are well worth a visit.